Hello and greetings from the Pacific Northwest. For this edition of the AMGA Mountain Bulletin, I'm writing about the exciting changes that are taking place in the Certified Guides Federation (CGF). As many of you are aware, the AMGA Annual Meeting last fall was somewhat of a historic milestone in terms access; the AMGA conducted a second, and highly productive, round table session in which over 75 members of the guiding community came together to share ideas and concerns about access in the US. In addition to the round table, substantial time during the open session of the AMGA BoD meeting was devoted to the CGF and access. The dialogue that came from these meetings sparked a substantial development in the direction of the CGF. Since last October, many changes have occurred in the proposal set forth by the CGF – the most significant being the shift towards forming a cooperative versus an employee model. Following the meeting, the AMGA voted to create a sub-committee comprised of myself and members of both organizations to look into the viability of a coop model replacing the existing structure of the CGF. 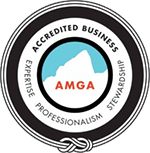 Research and efforts from the CGF and the AMGA-CGF subcommittee show that a transition to a cooperative appears to be the best fit for the Certified Guide and the original mission statement of the CGF. This new organization will be known as the Certified Guides Cooperative (CGC). The model in which the member-guides are owners and control the organization of the Certified Guides Cooperative (CGC) solves several issues at hand that were faced with previous versions of the CGF. First, the issue of subcontracting is solved; if a guide is an owner of an organization, he/she is not considered a subcontractor. Secondly, as owners of the coop, guides will not be required to the pay the high percentage of their gross pay that was previously discussed in the CGF proposal at the fall meeting (there will be a per-trip fee charged of the guide – known in a coop as a per-unit retain – but it will be much less than 32%). Thirdly, member-guides will have a say in how the organization is run. This includes everything from voting for the board of directors to choosing which permits to obtain and so on. The user-benefited principle states that the cooperative's sole purpose is to provide and distribute benefits to members on the basis of their use. Guides who join the CGC will come together in a cooperative and receive benefits that are otherwise unavailable to the Certified Guide working in the US. These include an affordable liability insurance policy and the permits to work at various locations throughout the country. As we move forward with our transition towards the coop, we will be following a framework often used in starting cooperatives. Many of these steps still need to be completed, some of which I will need your help and input on – we will be sending a targeted survey to assess the needs and the potential use a Certified Guide will have of the new cooperative. Please stay tuned for upcoming surveys, emails, and announcements from the CGF as we begin our exciting transition to a cooperative. And please feel free to get in touch me if you have any questions.